The Christian community is divided over many things, not the least of which is how we should relate to Jews in general and the nation of Israel in particular. Has God rejected Israel, individually or collectively? Are we to support the secular nation or to condemn it? And does our decision on this matter say anything about our spirituality? Recent news of a deadly terrorist attack on worshipers at a Jerusalem synagogue brings to the forefront once again the question of how Christians today should relate to Jews and the nation of Israel. There is deep division on this matter, with one side solidly in support of Israel and the Jews as still God’s chosen people, and the other side completely opposed to the existence of Israel as a nation and the Jews as chosen. Those in support of Israel and Jews cite the promise to Abraham in Gen. 12:2-3, the fact that Jesus and the apostles were all Jews, the irrevocable promises of God to the physical nation of Israel descended from the line of Abraham, Isaac, and Jacob, as well as specific prophecies concerning the land of Israel. Those in opposition say that the promise was only to Abraham personally, that the ethnicity of Jesus and the apostles is no longer relevant since their people rejected Jesus, and that this rejection includes the right to the land and is permanent. In passages such as Rom. 4 and Rom. 11, Paul taught that the physical descendents of Abraham, Isaac, and Jacob were still the chosen people of God, and this was written well after Jesus was crucified and risen, even after Pentecost. When Paul speaks of spiritual Israel, he is contrasting it with unspiritual Israel, not with Gentiles. His central point is that simply being descended from the line of Abraham, Isaac, and Jacob was not enough to justify anyone before God. And in spite of having been scattered and rejected in the past, a faithful remnant of the nation of Israel was always restored to the land. Thus we cannot say that this time God has rejected them forever because of their sins. Come, Zion! Escape, you who live in Daughter Babylon! For this is what the Lord Almighty says: After the Glorious One has sent me against the nations that have plundered you— for whoever touches you touches the apple of his eye— I will surely raise my hand against them so that their slaves will plunder them. Then you will know that the Lord Almighty has sent me. The “nations that plundered” them were sent by God, but those same plunderers were then punished as well. The purpose was to glorify God rather than the wayward, rebellious, “stiff-necked” people of Israel— a condition they remain in to this day. Yet it is clear that God never ceased to say they were his people. In Jeremiah 31:37 we are told that God will never reject the people of Israel, in spite of all they have done, and in Ezekiel 36:22-23 it states very clearly that the purpose of God is to prove himself holy in spite of their habit of giving him a bad reputation. We see in those passages that his purposes do not depend upon the faith of his people. In fact, God states clearly that Israel has profaned his name and made him the object of scorn among the Gentiles. So the argument that Israel today is not the chosen people of God is invalid, since it has nothing to do with their merit. God has scattered them before but brought them back again, so there is no reason to presume that he will not do so in the future. This hardly means that we should blindly support everything done by the nation of Israel, yet we must remember that no nation in the world has a right to point fingers in condemnation, as they are all corrupt. We must also remember that the stated purpose of the 70 Weeks prophecy of Dan. 9:24-27 is to bring them back to God, which means that they must be in rebellion against God for the final Week to begin. This is their indisputable condition today, and as has been argued, we dare not take it upon ourselves to punish them. But what about the land, does it still belong to them? The original land of Israel was determined by God Himself: “the land of the Canaanites, Hittites, Amorites, Perizzites, Hivites and Jebusites” (Ex. 3:8, 13:5, etc.) This area is currently known as Egypt, Sudan, Lebanon, Jordan, Syria, Iraq, part of Turkey, and Israel, including Gaza and the West Bank. God promised this area to Abraham’s descendants. And there is ample archaeological evidence to support the Bible’s account of the long history of the Hebrew people in that area, while none exist for any such people as the Palestinians (see this article). Most of what causes Christians to divide on this issue is derived from incomplete or one-sided mainstream news, along with an inadequate knowledge of the scriptures. To defend Israel when it truly has been the victim of terrorism is not to say that Israel never does anything wrong, and to be against inhumane treatment of people living in the area claimed by the Palestinian State does not legitimize that claim to statehood. Just as we cannot excuse the sins of the Israelis, so also we cannot excuse the sins of their enemies. We as Christians must stand together against sin and injustice, but this requires us to be adequately informed of history, current events, and scripture. The nation of Israel has as much right to exist as any other nation, since all nations were the result of conquest at some point. 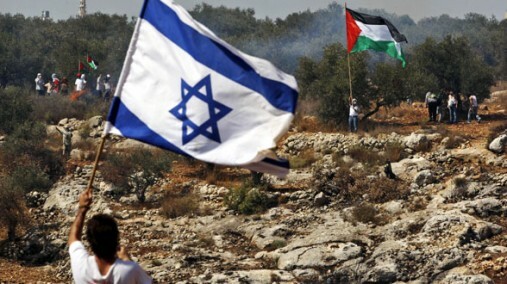 The people called Palestinians should be given land by their own allies with much more territory to spare; their being used as political footballs is the sin of the nations surrounding Israel. If we truly care about refugees, we will not demand concessions from the nation with the least amount of land. Christians are indeed tasked with caring for the oppressed, but we must do so without prejudice. Jesus’ indictment against those who mistreat “the least of these” will not be done with partiality. But when we side with the unbelieving world to condemn all Jews as “evil Zionists” and Israel as “the aggressor”, we show partiality and care more about being politically correct than helping the truly oppressed. Nothing will be solved by laying all blame on one side or the other, or by turning against each other in a “holier than thou” shouting match that only proves neither side is holy at all.